I whipped these up the other night for a character creation session we attended. So tasty! Definitely helped me keep my mind as off topic as possible hehe. Part of the fun of character creation is the goofing off in between all the game mechanics stuff. Didn’t finish making the character yet but atleast I got my cookie on! It’s definitely game starting season out here so I expect to making more and more shareable treats. Combine the oats, baking soda, and flour. Add the sugar, milk, margarine, vanilla, and applesauce. When moistened add the skor bits and chocolate chips. Using a teaspoon, measure each cookie and roll them into a ball. Place on the baking sheet and flatten a bit using a spoon or fork. Bake at 325F for 13-15 minutes. Check the bottom of the cookies to make sure they are done. Just a bit of browning is good for a nice chewy cookie. Makes 32 cookies. Each cookie is 57 calories, 1 gram of fat and .7 grams fibre. They are definitely durable enough for travel and sharing! They also definitely help when that need for chocolate hits. 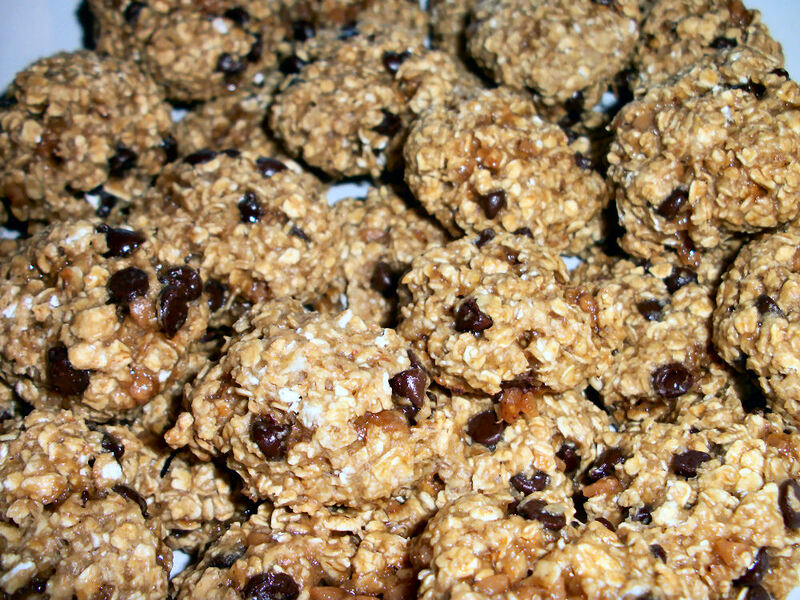 This entry was posted in Comfort Foods, Craving Buster, Dessert, Snack and tagged chocolate, Oatmeal, Toffee. Bookmark the permalink.